To access frame controls for an active box, click the Frame tab of the Measurements palette. To access attribute controls for an active line, click the Home/Classic tab of the Measurements palette. Use the controls shown here to specify style, width, color, and opacity. 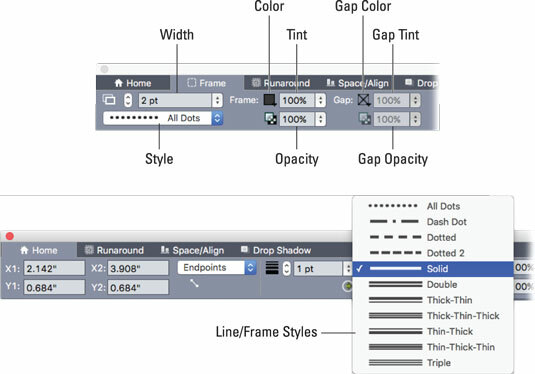 If the frame or line style contains gaps, you can also specify gap color and opacity. Frame (top) and line (bottom) style controls. When applying a “Scotch rule” style (any of the thick-and-thin combinations), be sure to choose a width that’s wide enough to be clearly seen when printed. Try a minimum of 6 points for a double line and 9 points for a triple line. Inside: The frame on a picture box overlaps the picture, and the frame on a text box insets the text farther into the box. Outside: The frame is placed outside the box, increasing the box’s width and height. You can create your own frame styles by choosing Edit → Dashes and Stripes.